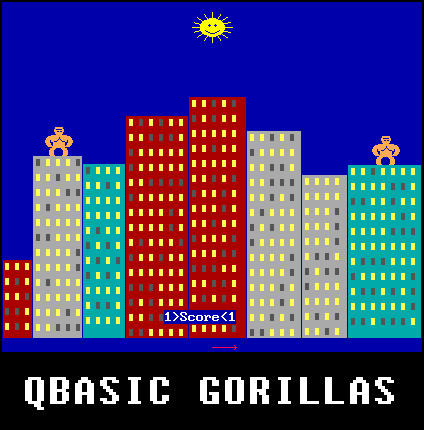 Gorilla is a video game first distributed with MS-DOS 5 and published in 1991 by IBM corporation. It is a turn-based artillery game. The game consists of two gorillas throwing explosive bananas at each other above a city skyline. The players can adjust the angle and velocity of each throw, as well as the gravitational pull of the planet. Written in QBasic, it is one of the programs included as a demonstration of that programming language. The others are Nibbles (another game), Money (a very simple financial calculator), and REMLINE (a program to remove line numbers from old BASIC programs).